In the beginning of April I began to change my routine, and started walking in the early morning. Since I live in Canada, there are times when our weather behaves exactly as those stereotypes say it does. It was cold and blustery well into May this year, and so I decided I needed a hat. 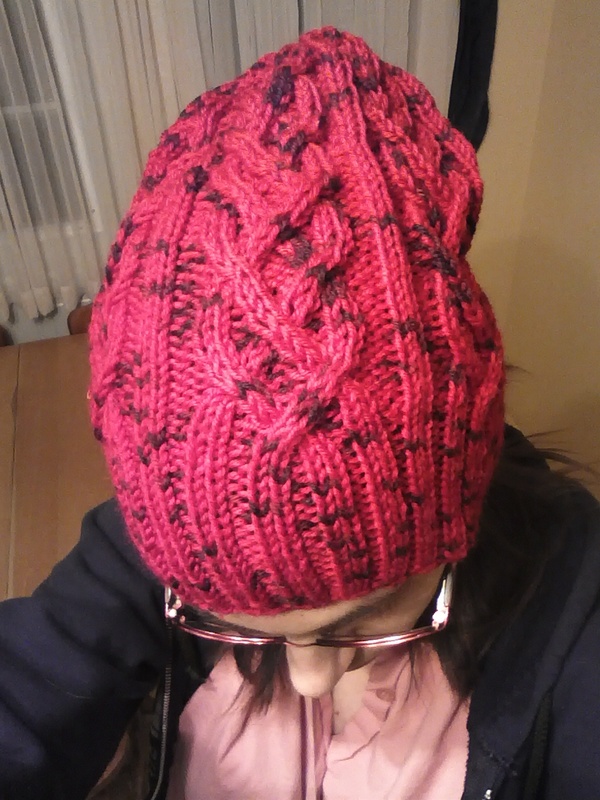 It’s no secret I love cables, so I wanted a cabled hat. 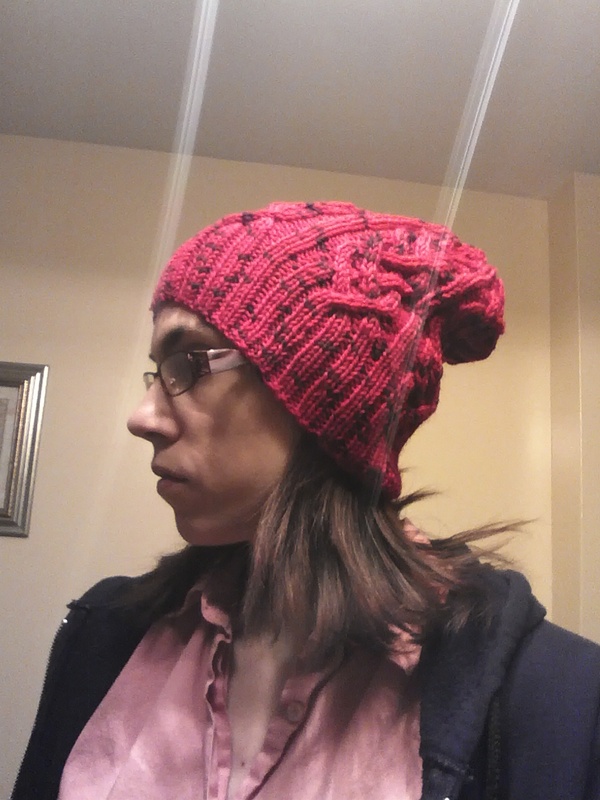 I found the pattern Slouchy Bubbles, which is a free slouch toque. Since I frequently put my hair up, I wanted a hat that would hold it in and still cover my ears – a slouch is perfect for that. There is a gauge to the pattern, but if you have followed this blog at all, you can probably guess quite correctly that I didn’t bother with it. I just grabbed a worsted and went to town. It did knit up quite quickly, though for some reason I just could not wrap my brain around the stitch pattern. I can normally memorize a cable pattern rather quickly, but this one is a bit more involved and my pencil was a huge friend as I constantly marked where I was. I found (likely since I didn’t swatch) that this was a very slouchy hat. The width is absolutely perfect, but there is a ton of fabric on the top and it was a bit more than what I was going for. So, I stopped at 2.5 repeats rather than the three called for. 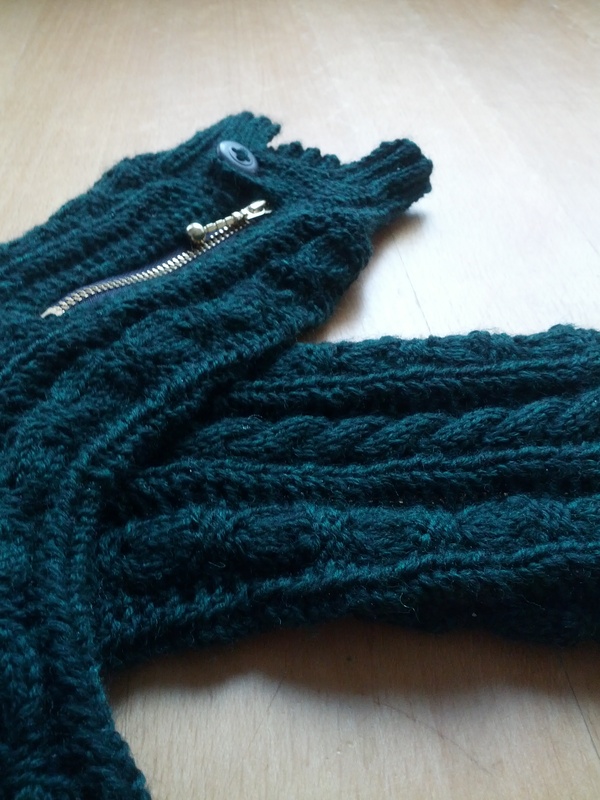 There is a matching mittens pattern, and I think I have enough of this yarn left that I may knit the set. Of course, I managed to finish this hat in June, when I no longer need it for this year. So maybe I’ll just claim my intent was to knit it in time for next winter. You believe that, right? 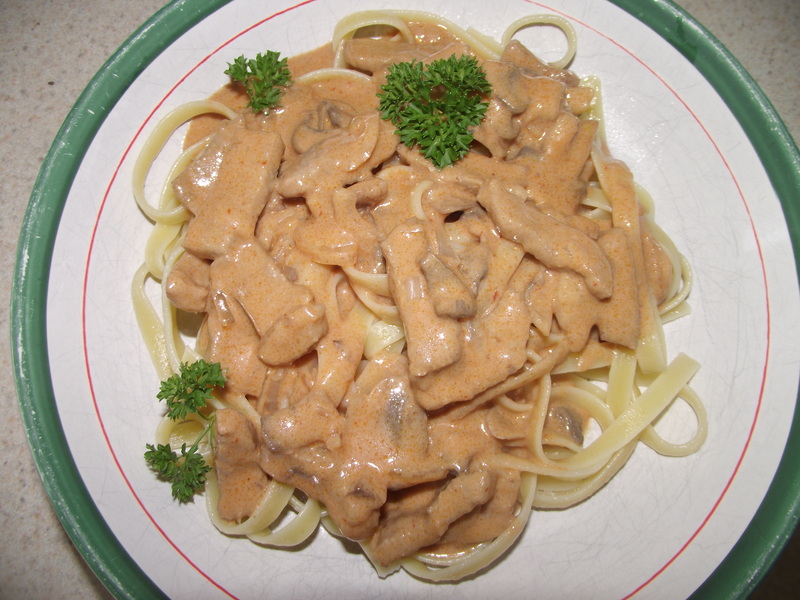 This entry was posted in finishes, knitting on June 26, 2013 by Christine. While I was busy in Sock Madness, I took the down time in between rounds and did a bit of crochet. 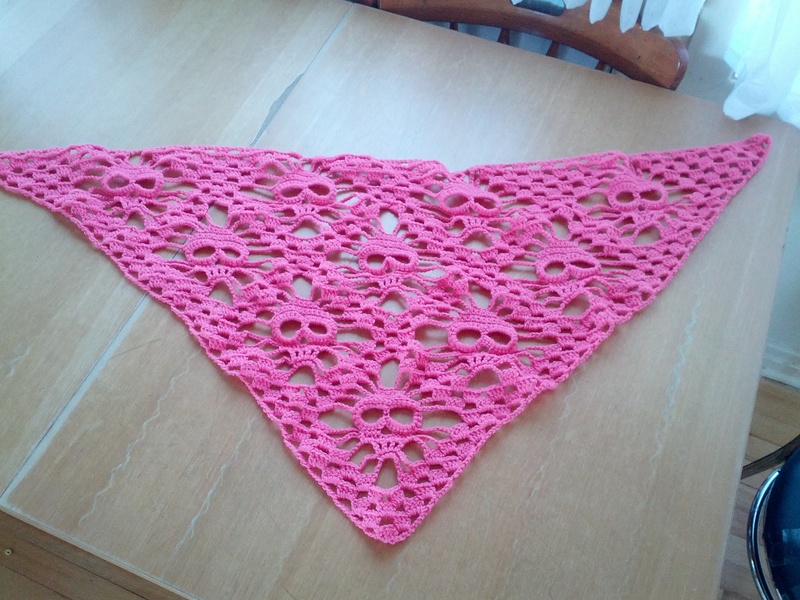 This Skull Shawl pattern was released in April and it was a sweeping success right away. I’m sure, like many crocheters, I saw this and needed to make one. I had some lovely hot pink yarn in my stash and away I went. The pattern is really quite simple, although there are a few points here and there that translation is a little tricky. The pattern is really for the skull portion, and your sizing is really up to you. I had hoped I would have enough yarn to go for 6 repeats at the top, but turns out this project is a massive yarn eater. 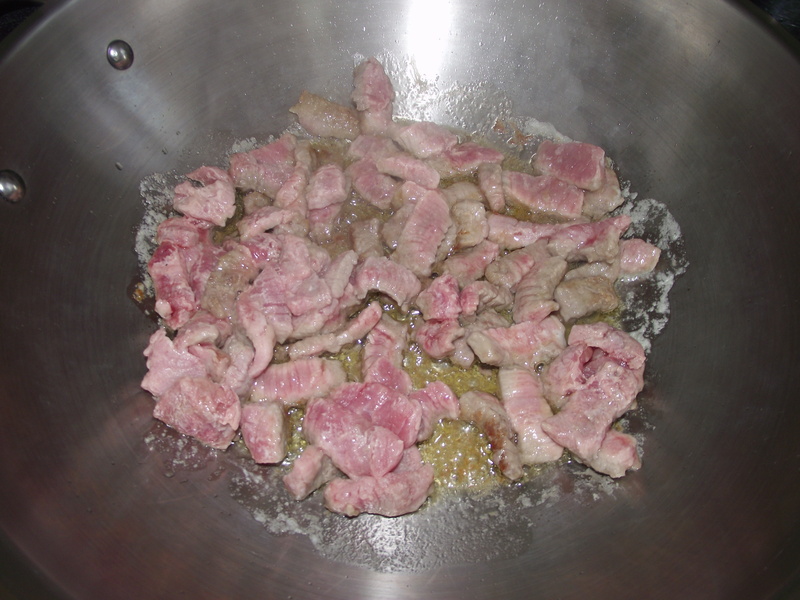 I used not only the English translation provided on the blog, but also Google translate. 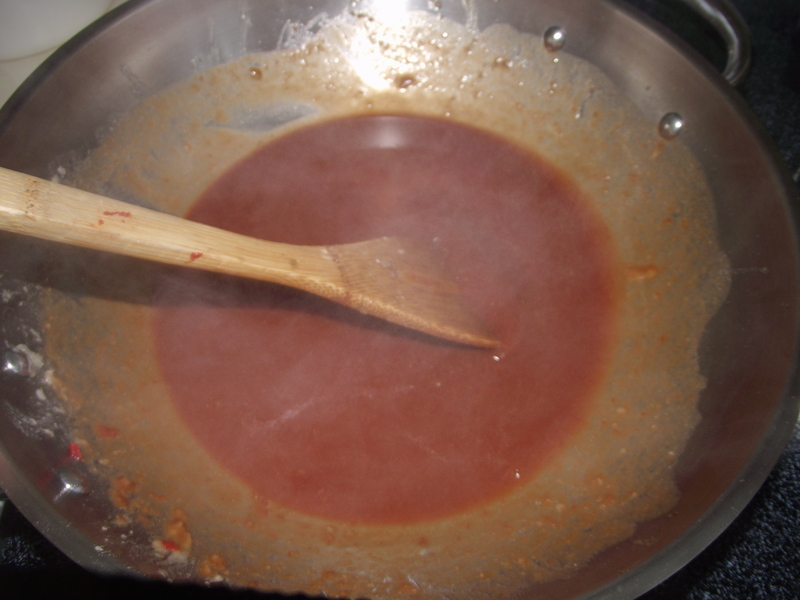 I found that this cleared up a few trouble spots. Also, if you decide to make this yourself, I recommend making the eyes first so you aren’t constantly cutting and re-attaching your yarn. 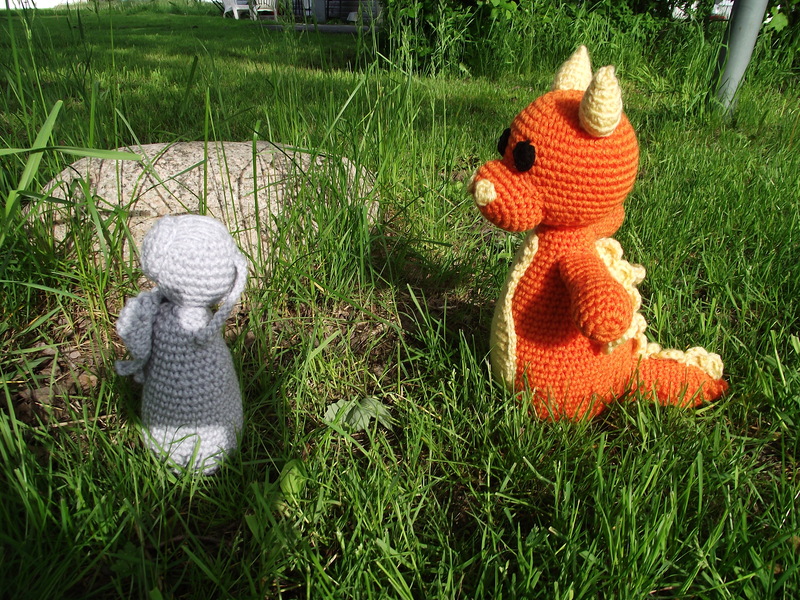 As an interesting aside, this is my most viewed project on Ravelry. 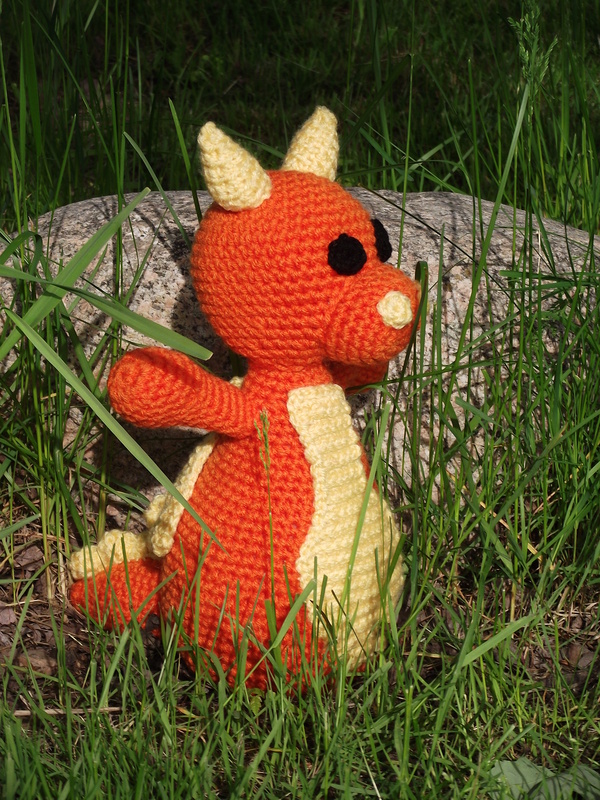 Moving on, I’ve been wanting to work on my amigurumi skills. I have crocheted a few projects that do this, and I’m discovering that the larger the project, the better for me. 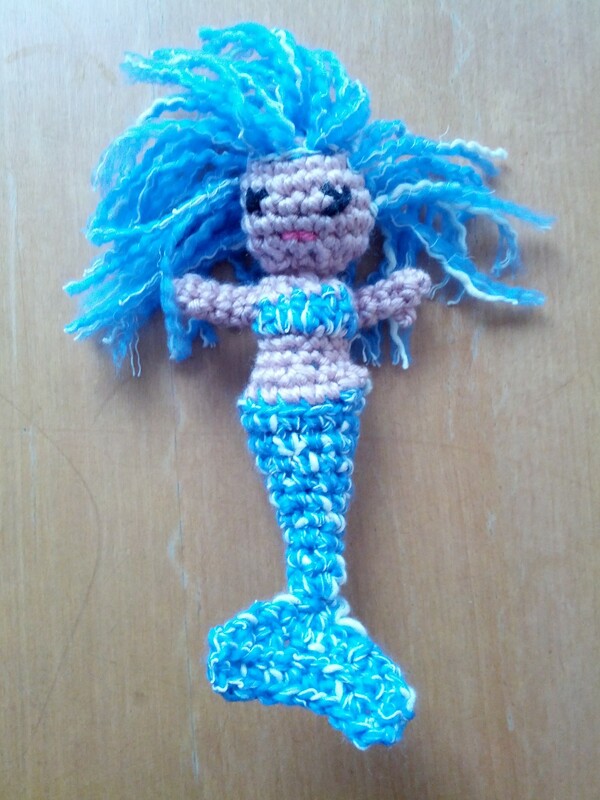 Amigurumi is the art of crocheting small figures, and really what I have done can’t honestly be described as such, with the exception of my first project, a mini mermaid (pattern link). This poor girl is, well for lack of better descriptors, just sad. It was mentioned that a smaller gauge would probably improve her appearance (and maybe make her less zombie-like), and I agree. She stands just over three inches tall and despite her small size, it still doesn’t work. She looks to me a bit more evil than mermaids are reputed to be, and I wasn’t going for that. Maybe she would do well as a voodoo mermaid. The next project I made was a bit bigger, and I’m much happier with. I’ve been catching up with the rest of the planet on episodes of Dr. Who (still watching, no spoilers, please! 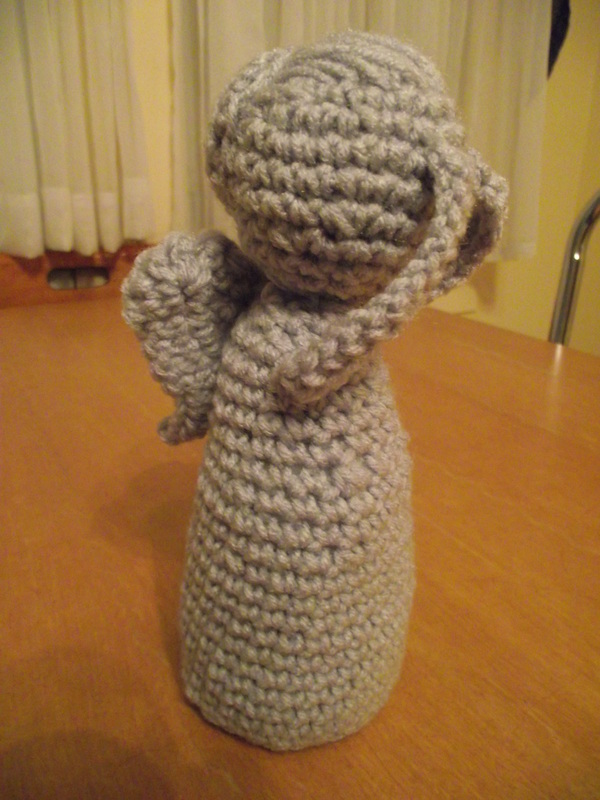 ), and found a weeping angel pattern that is just delightful. 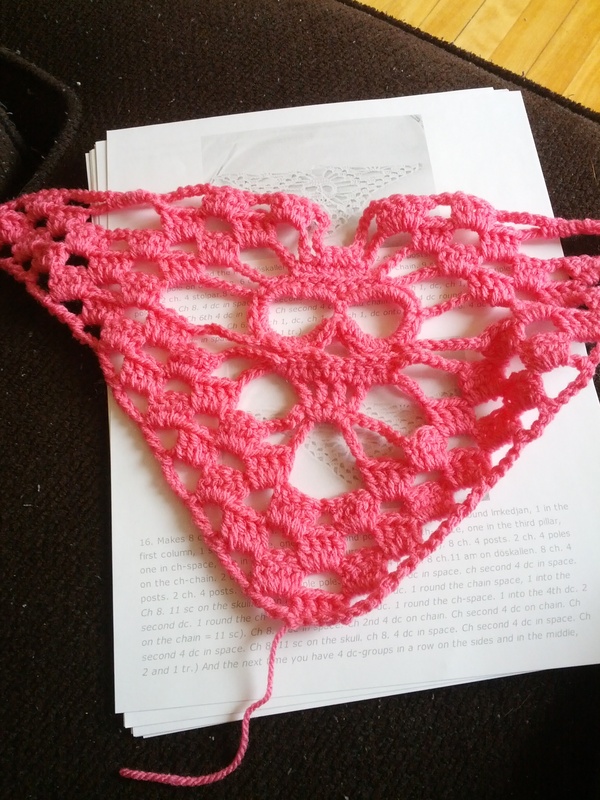 I would love to share the pattern with you, unfortunately, in the short time since crocheting this pattern and now, the blog that published it has been deleted. She stands eight inches tall, and was very fast to crochet up. I would love to have a whole army of these, but then I would never be able to move and be forced to stare at them all day long. 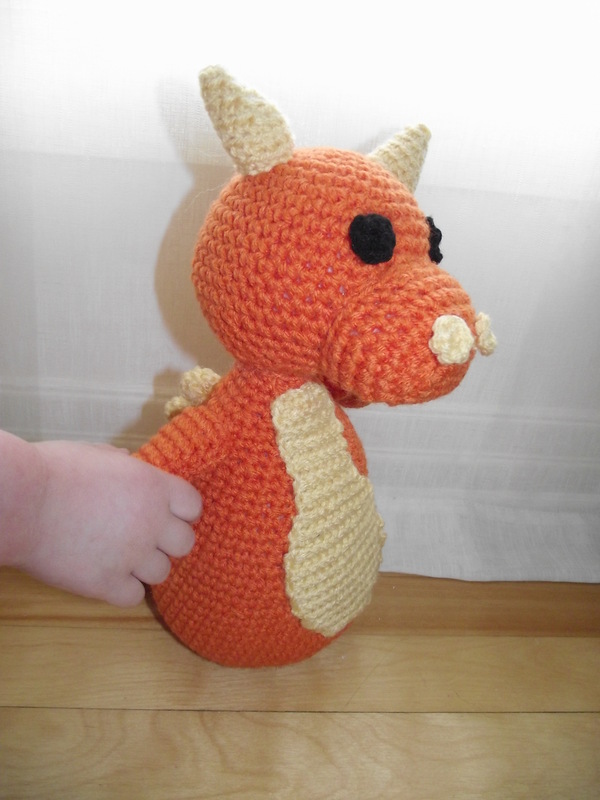 My next project was also quite fun, a stuffed dragon. Again, the pattern no longer appears to be available on the website, so either my timing is incredible or I’m a ray of death on these patterns. No matter, it seemed I got this one in time, and worked him up fairly quickly. I actually did two versions of this, for several reasons. The first, and based on the photo, the most obvious, is that my son couldn’t keep his hands off of the dragon, and rather quickly claimed him. 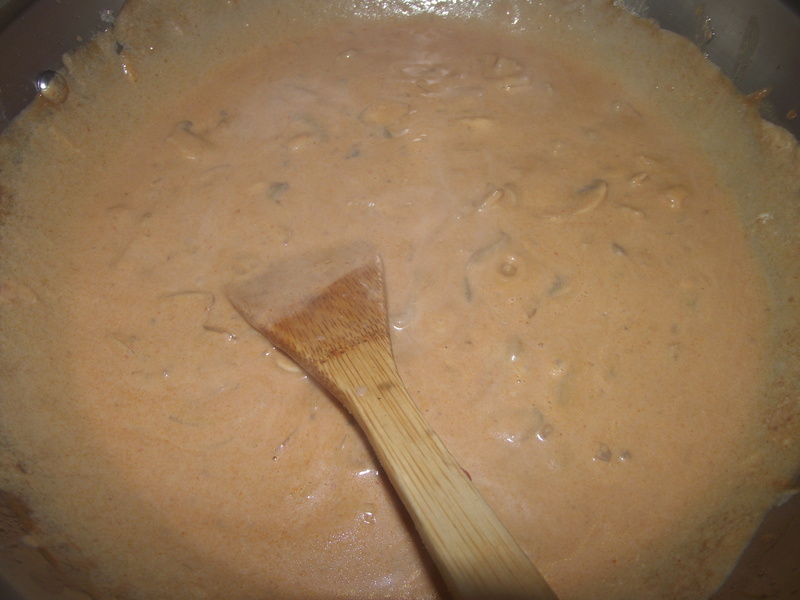 Second, there were portions of the pattern I wasn’t happy with. His tummy looked thrown together, and his tail was just… wrong. For my second version, I cleaned up his tummy and lengthened his tail, and added wings. Because dragons have wings. He’s a bit taller still, standing 13.5 inches tall. Just the right size for little arms. And now, we have a Sean dragon and a Mommy dragon pair. And what have I been doing with these? Playing, of course! Bet you didn’t know weeping angels are afraid of dragons. 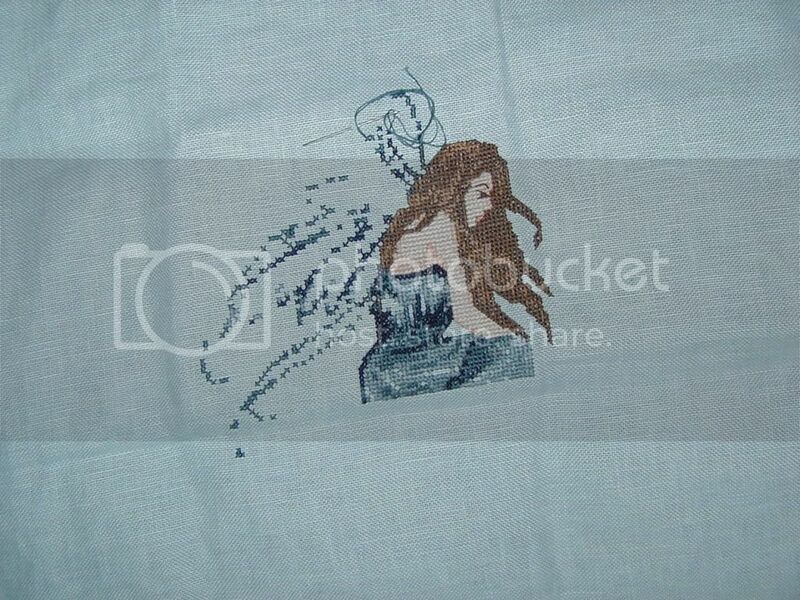 This entry was posted in crochet, finishes on June 23, 2013 by Christine. And on to round six! This was the toughest round of Sock Madness thus far, not because of the difficulty of the sock (which I don’t think is difficult at all), but due to the time constraints. At this time, we were down to seven players per team, and for this round one player per team progressed to the final round. This would have to be our fastest knitting thus far. While I did score a personal best, I was not fast enough to get that last spot. It took me about 12.5 hours to knit one sock, and by the next morning a winner for our team had been posted. Since this kicked me out of the competition, I took my time with the second sock (still finished a full pair in just over 4 days). As I’ve mentioned, Swirling Vortex is a pretty easy pattern. It’s toe up, using a crochet provisional cast on (a new technique for me). 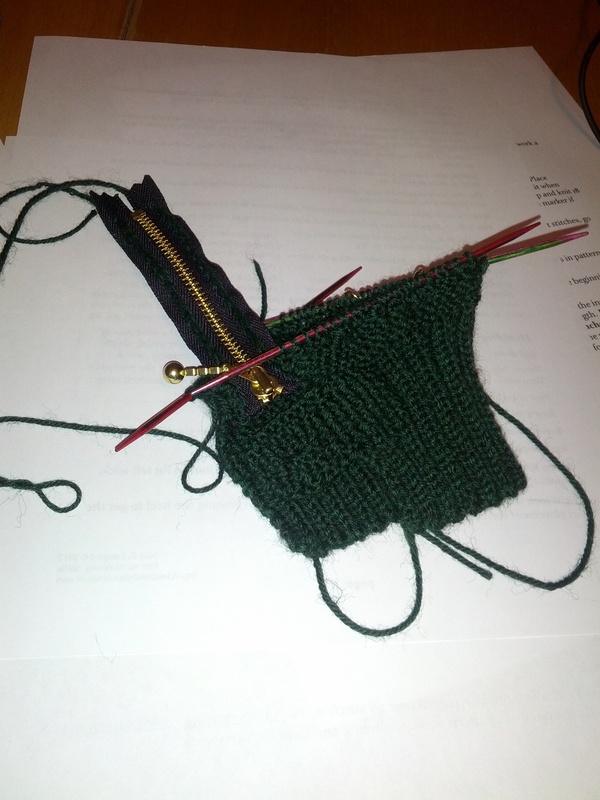 One knits the foot then heel, and then the leg, keeping the gusset portion open. The magic of the swirl happens at the end, and the sock is finished off at the center point. The pattern recommends a self-striping yarn, and I wholeheartedly agree. I used Nooch Fiber’s Midtown Sock in The State I’m In, and although it’s a pretty yarn, it’s not quite right for this sock. You should see some of the photos with self-striping yarns. FANTASTIC. 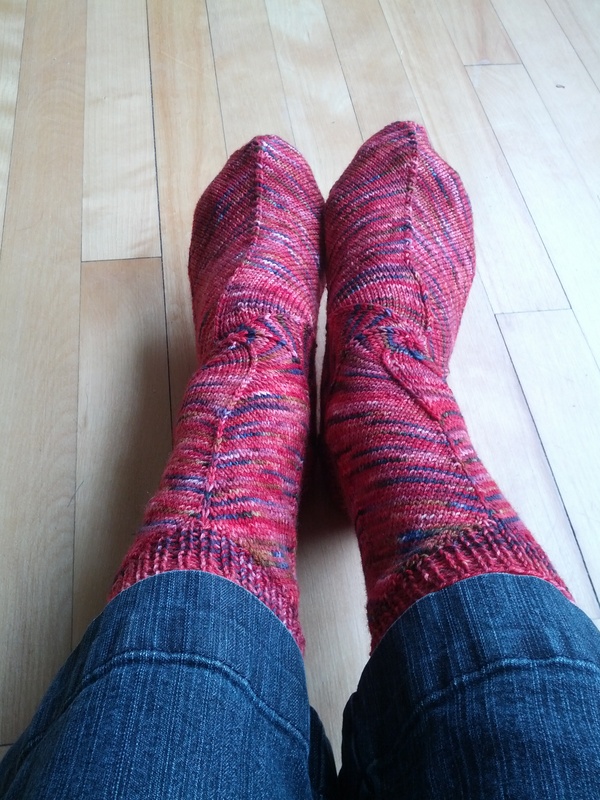 I am not a fan of self-striping yarns, but I may have to pick some up anyway to do this pair again. Just as a quick aside, I want to share the last pattern the winners of the round were assigned. Labyrinthine is a massive undertaking, using a five colour cast on which the eventual winner took 8 hours just to do on one sock. Incredible results, though, and you should look through the growing library of photos for this sock – it made me heave a sigh of relief that I wasn’t’ in the final round! Have no fear, though, I will be knitting it. My kit is ready! This entry was posted in finishes, knitting on June 22, 2013 by Christine. 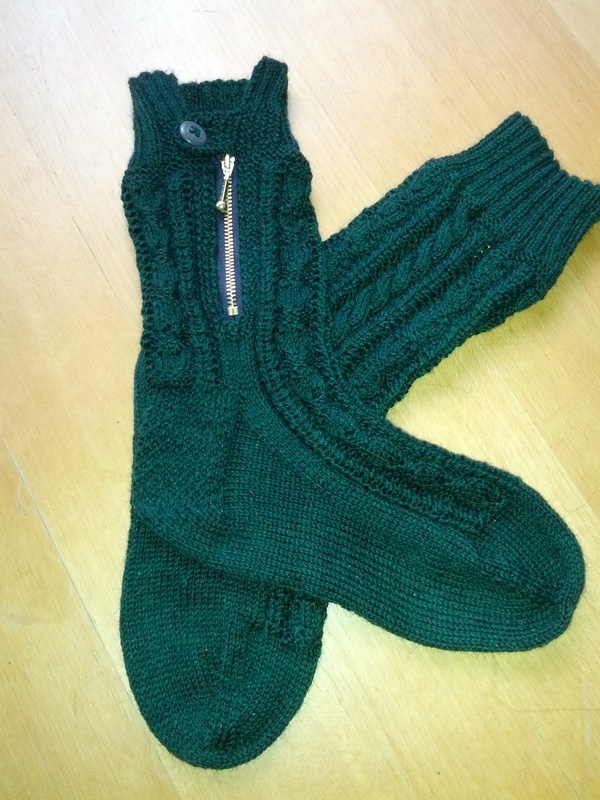 Round five of Sock Madness gave us a fantastic challenge: to knit a zipper right into our socks. Now I learned about including zippers by sewing them in. That’s what one does. I’ve learned to cheat without a zipper foot, and it’s not problem at all. To knit one in, however, is just magic. There has been a lot of magic in this competition so far, but this was the first sock that I felt like super woman while knitting it. There is some very simple prep that is required before you knit in a zipper into your garment, but once that is done, it’s DEAD EASY. And I’m going to do it again, oh yes I am! Essentially you crochet a chain onto the outside of your zipper, then pick up that chain as you come to it, knitting your way down the zipper (from the cuff). This of course means you are knitting flat, but I found it easier to keep my zippers closed and go back and forth pretending I was in the round. These were knit in Knit Picks Aurora Heather. Super fun, a lot easier than it looks. Just trust the pattern and it all works out. There’s even a lovely cable on the opposite side of the zipper to keep you moving. Of all of the socks I’ve knit for this competition, this one is probably my favourite. It’s not your standard sock, and most would likely feel the zipper is too much. But consider that the technique taught, and that this is a small project to get that feel for it; it makes much more sense. I also love wearing these. Besides the zipper, I had a big clue in on these socks. I’ve been measuring my feet wrong. Prior to this, my socks have been *just* that little bit too large. I took several re-measures and actually have an appropriate foot length, and these ones fit superbly. And so shall every sock from now on. 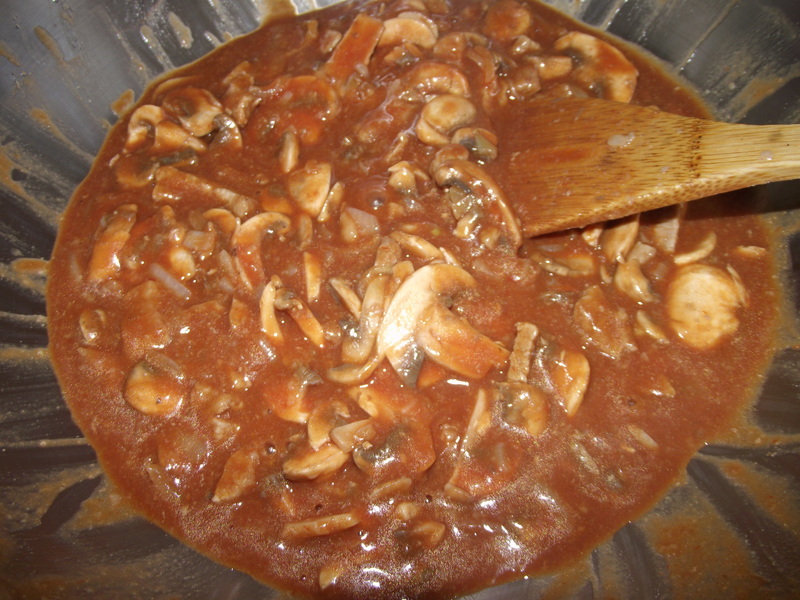 This entry was posted in finishes, knitting on June 21, 2013 by Christine. I did it again, I walked away and left you all stranded. After seven years one would think I would have some sort of blogging schedule or something. Anyway. Moving on. When we last left this intrepid explorer, I had progressed to round four of Sock Madness. Things were not getting a bit more difficult and faster moving. 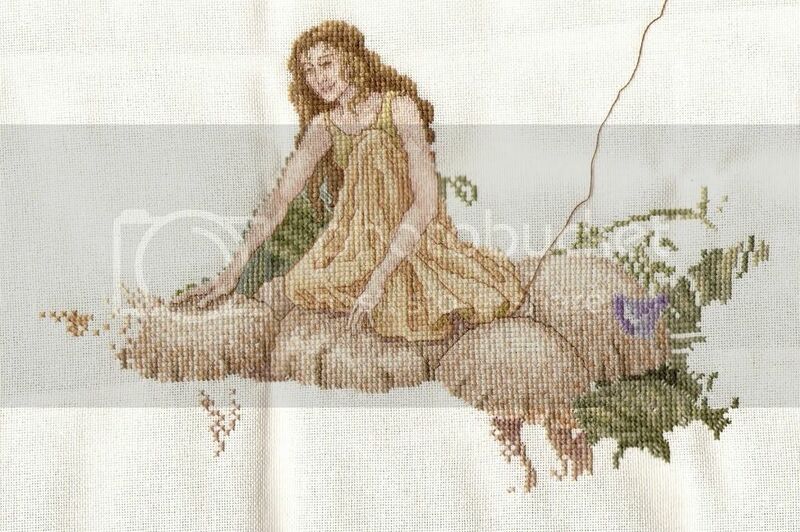 The next pattern we were issued was High Button Socks by Bridget Landry. These are a toe up sock with a princess sole. Which, I learned, is the knit side is on the inside of the sock, the purls on the outside. This apparently makes for a softer foot, fit for a princess. It is very soft, but I suppose my calloused feet are too far gone to really notice a difference. These are knit in Knit Picks Stroll Sapphire Heather, which turned out nicely for this pattern. I do want to update the buttons to a brass button, though, to keep up with a Victorian look. The big thing I learned on this pair was that my laddering on double point needles with purls is HORRIBLE. 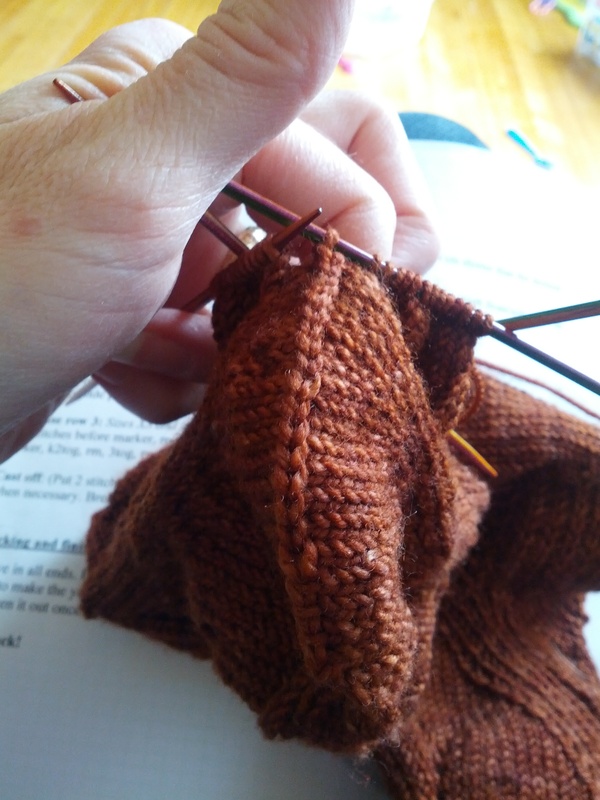 I’m not a fan of socks on circular needles, but to avoid the laddering I was almost forced to use them. Which of course worked out fine on the leg portion. This one caused a lot of issue with competitors because there are additional stitches on the leg that can be easily missed. 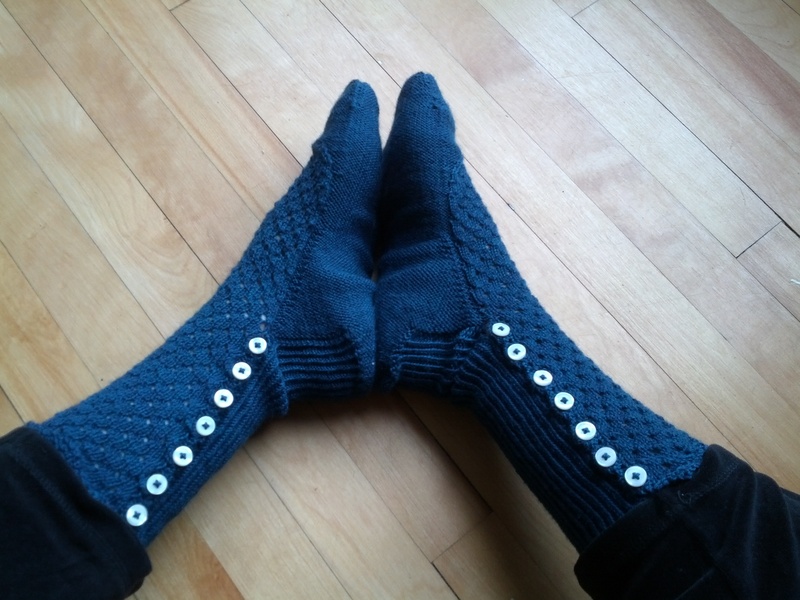 If you decide to knit these yourself, and you should, make sure you are paying attention to the button hole increases. I did finish on time, and progressed on to round five. This entry was posted in finishes, knitting on June 20, 2013 by Christine. The next round of Sock Madness gave us a pattern called “Greenhouse socks”. I have no idea why they are called that. I’m sure there is a reason. Anyway. The special thing about these socks is the foot. The leg is pretty standard, some diamond lace motifs that just fly by. The foot, however is something else entirely. The sole of this sock is actually shaped like a foot. I neglected to take a photo of the sole, but if you look at the bottom of your foot, that’s what it looks like. It makes for a very interesting fit. 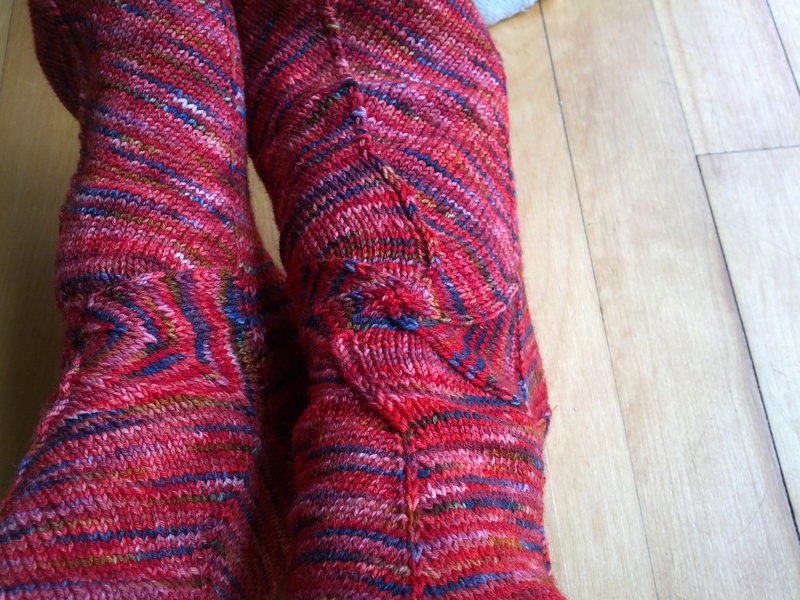 The toe section goes wide, and has an almost three-needle bind off, and is pretty crazy. But, if you have a wide foot like me, it gives the sock a SUPER comfortable fit. There was a bit more confusion with this pattern than other patterns in the Sock Madness challenge. It was a bit unclear as to where to start the toe shaping and I felt that it could have been explained a bit better. It has you work one pattern on the sole, then another on the sides, then another on the top of the foot. At times, they do not work in tandem. For my own socks (and sanity) I fudged the numbers just a little once the diamond motifs were done to make the top and bottom of the foot work in together at the same point in the pattern. You can see a bit of the foot shaping in this photo. As well, it assumes you know your own fit. I would not recommend this as a beginner sock knitter pattern, since if you follow it to the letter you will end up with a 16″ sock for a 9″ foot. You basically just stop knitting when you reach the desired length, and bind off; there is no indication of this in the pattern (that I saw). 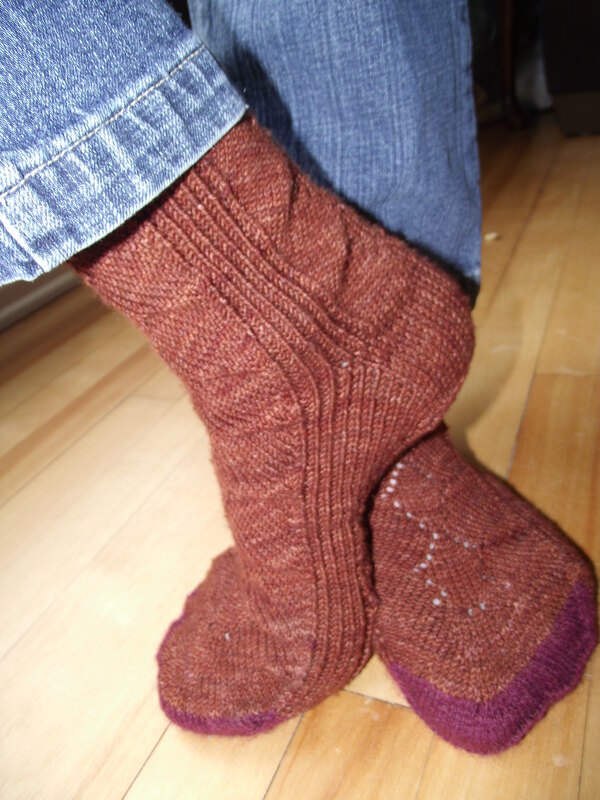 This pair was knit in Nooch Fiber‘s Morningside Sock in the Cigar colourway. Let me wax poetic about this yarn for a moment. It’s amazing. So very soft and squooshy, yet a substantial yarn. It has amazing definition, and was such a delight to work with. It practically begs to be a sweater. You know, if this indie dyer made sweater quantities of this yarn. The only issue I had was it was only 400 yards per skein. 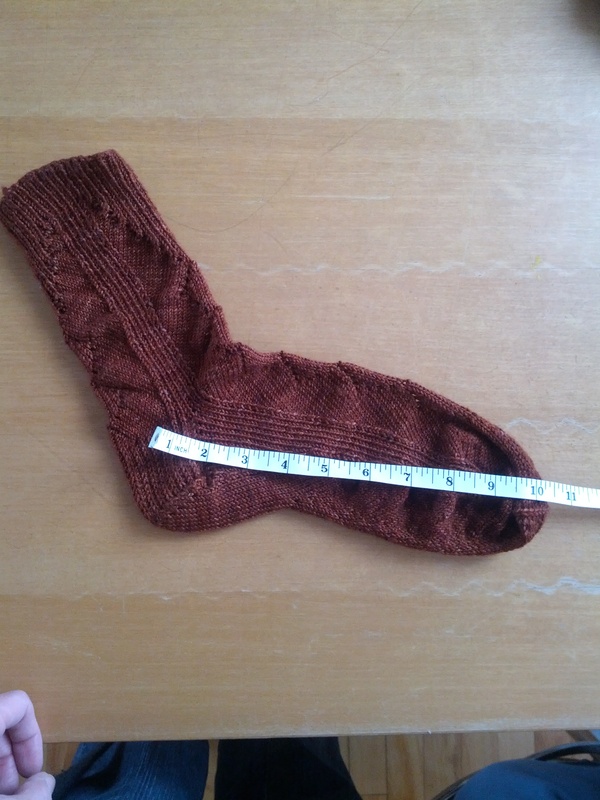 That is not normally an issue, except it makes a bit smaller sock; and this was not the right pattern for that. Admittedly, I made a bit of a change by adding an extra repeat on the leg since I like a longer leg sock. You can see in the first photo the toes have a different colour to them. Had I not made the change there would have been enough yarn to finish the pattern as intended. When it became apparent I wasn’t going to have enough yarn to finish the second sock, I took a chance in the Sock Madness race to pull out the toe on my first sock (which didn’t actually take a lot of self-convincing to do – it was an inch too long anyway), then I knit with the end of that yarn and pulled back to the same part on both socks. Then I knit both at the same time to have the same end point with the Nooch yarn. This left only 7 rows (plus bind off) on both socks that needed a different yarn. All in all, I’m very happy with these socks. And my gamble paid off; I advanced to round 4! 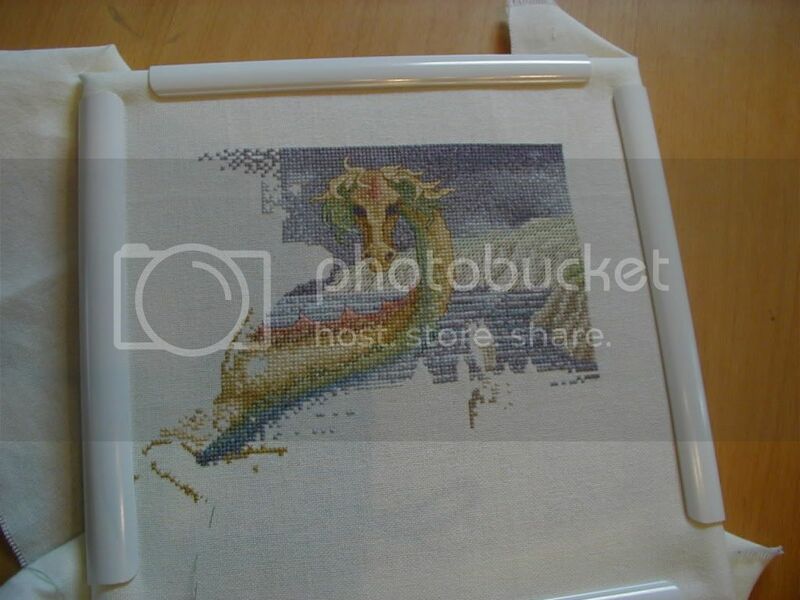 This entry was posted in finishes, knitting on May 13, 2013 by Christine.